I thought I was going to rest after the holidays but more holidays are still to come up. I have just cooked up a storm for Chinese new year so I am going to do a bit of magic for Valentine's day. 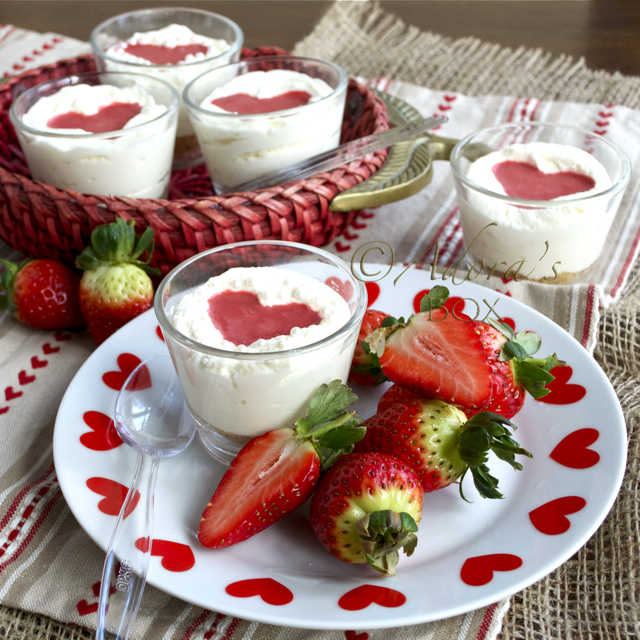 While most will be dining out on Valentine's day, some will stay in and have a do-it-yourself celebration at home. Mind that the occasion is about celebrating love so don't get yourself all frazzled and wipe out all that loving feeling. Simple and easy is the way to do it. I am not so much into celebrating Valentine's day but I like making a little something to mark the occasion. 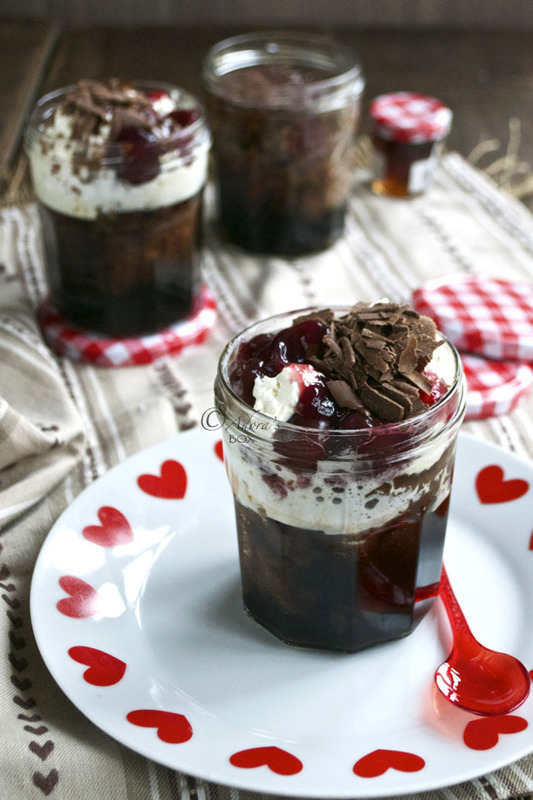 I made these simple self saucing chocolate puddings in jam jars for dessert. They cook in as little as 6 minutes and taste so delicious. The pudding cakes are as moist as you'd expect and breaks out in a puddle of sauce when you dig in. I added half a teaspoon of coffee to the sauce which made a huge difference to the taste. I served them with dollops of whipped double cream and black cherries. 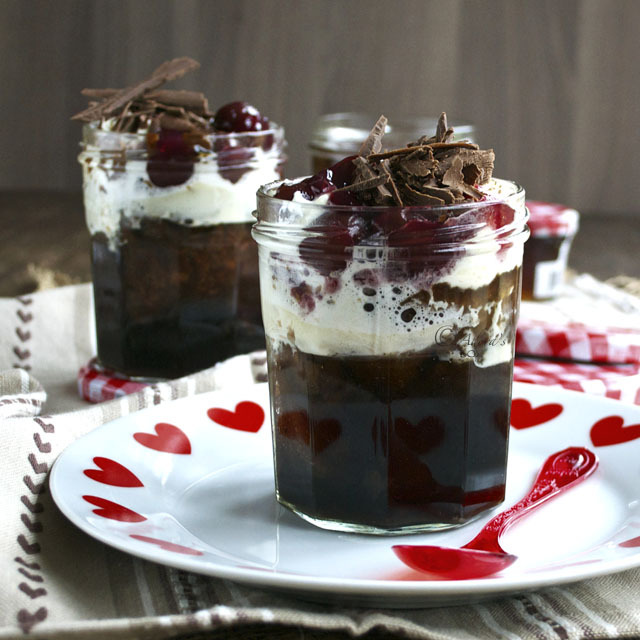 The cherries are optional but I wouldn't have it without that because that simple touch changed this simple pudding to a decadent dessert. Sprinkle on some chocolate shavings for good measure and serve with love. Adapted from Food Dept. 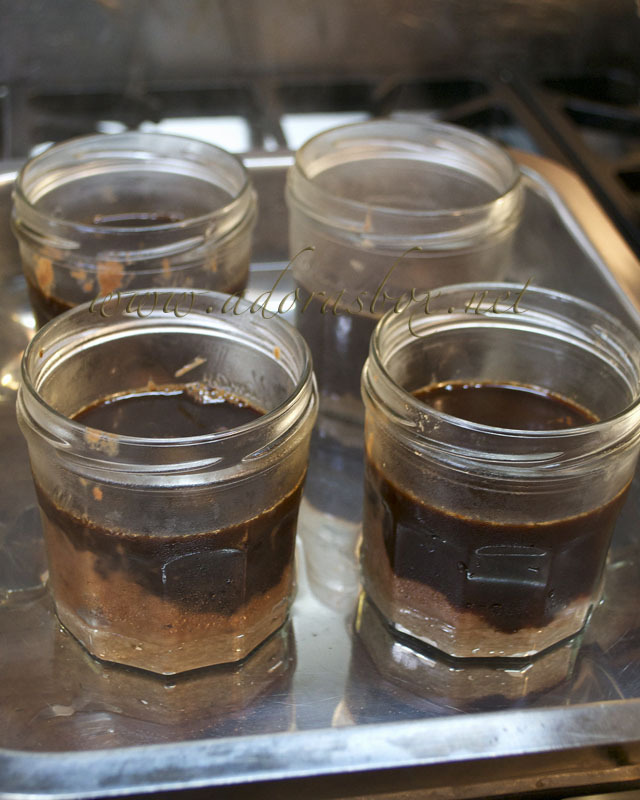 's recipe of Self Saucing Chocolate Puddings. Pre-heat oven to 350° F/180° C.
Sift flour, sugar and cocoa into a mixing bowl. Combine the milk, melted butter, egg, and vanilla extract together. Pour into the dry ingredients. Mix gently until just combined. Grease your chosen containers.You can use one large oven proof dish with a 4 c. capacity or use 4 individual containers such as jam jars, mugs or ramekins. Each container will take about 100 gms. of the mixture. In a jug, combine the boiling water and coffee and stir until melted. 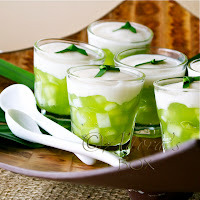 Mix the brown sugar and cocoa in a bowl befor adding to this liquid and stirring to avoid lumps. Pour on top of the pudding. If using individual containers, each will take about 100 mls. of this liquid. Bake for the large dish for 20-25 minutes. 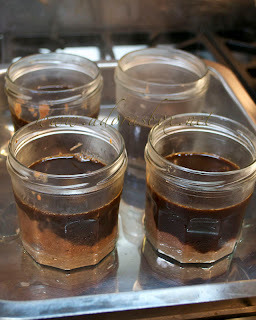 I baked the individual ones, au baine marie (to protect the jars) for 20 minutes. The water bath is not needed for oven proof containers. This can also be cooked in the microwave, uncovered, for 15 minutes for a large dish or 6 minutes for 4 individual containers on full power. The pudding is done when the pudding cake rises up to the surface and is puffed and set. The sauce remains at the bottom. Leave to stand for 5 minutes before serving. 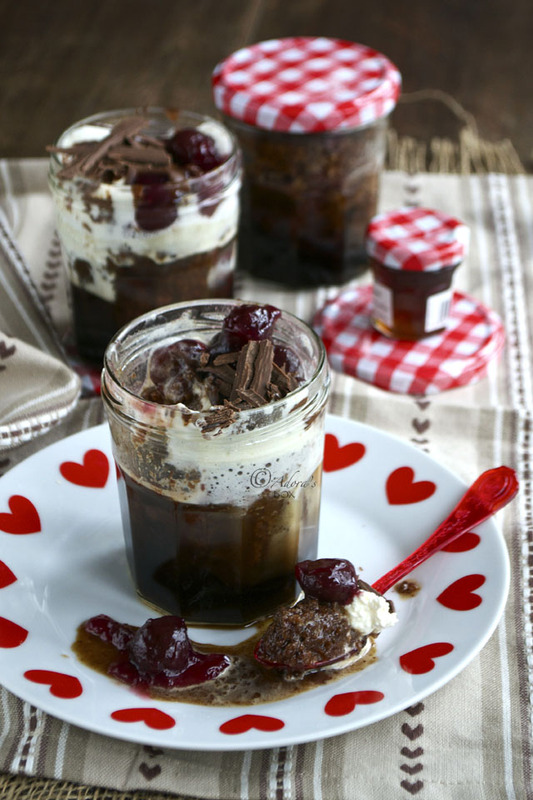 Top with dollops of whipped double cream and tinned black cherries or your choice of fruit conserve. Sprinkle with chocolate shavings. Happy Valentine's Day to you! Hope your day will be full of love and happiness with your family. Looking at your chocolate pudding just makes me drool.....yummy! Hi Mel! 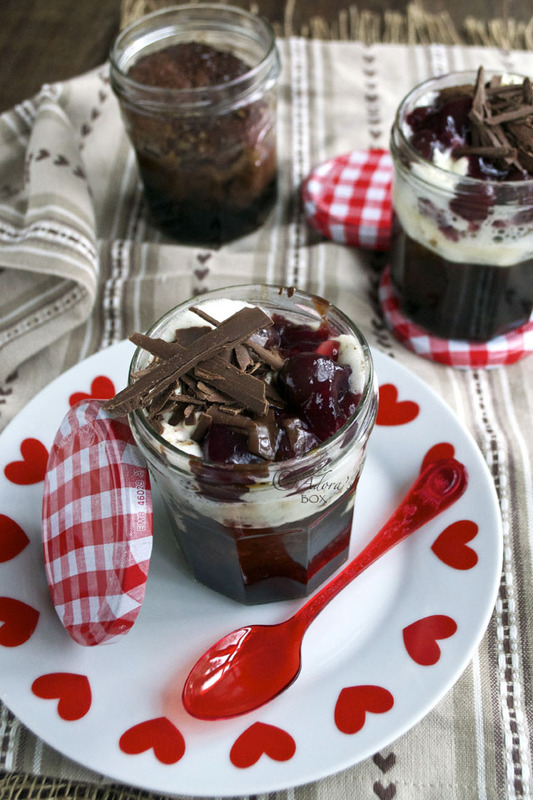 We don't really celebrate Valentine's day but having this pudding made us happy. I had to make 2 batches because the "kids" loved it. Hi Alvin! Those are empty jam jars that I re-used. They are rather cute so I don't throw them away. 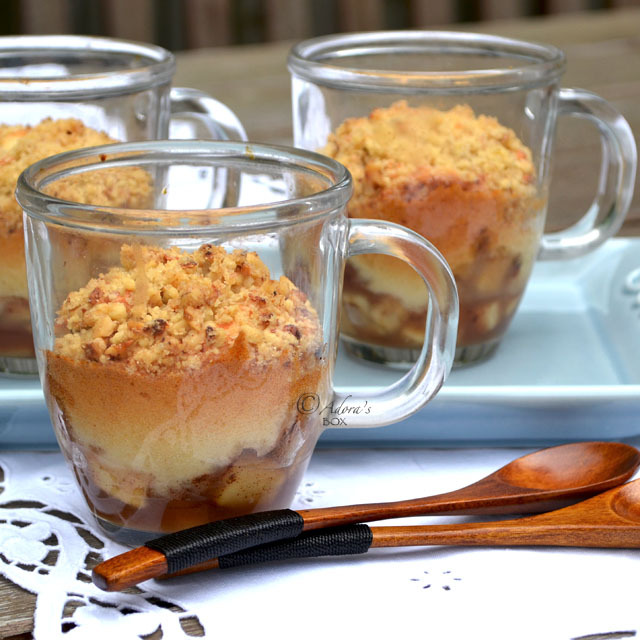 The puddings are yummy, I bet your little ones will like them. Awesome V-Day dessert, Adora! Love everything in it!